The Rycote Mini Windjammer provides optimum wind diffusion for smaller microphones. Like the standard Windjammer, the Mini Windjammer provides 10 - 12dB extra protection over standard windscreens. 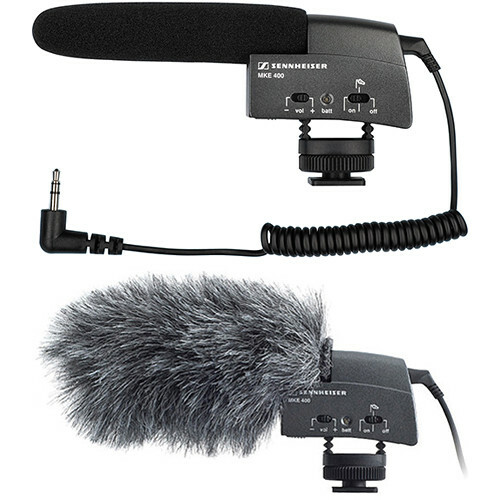 This Windjammer accommodates the Sennheiser MKE400 microphone. Box Dimensions (LxWxH) 6.0 x 2.7 x 0.7"
Sennheiser MKE400 Ultra Compact Shotgun Mic and Windjammer Kit is rated 1.5 out of 5 by 2. Rated 1 out of 5 by Anonymous from Horrible mic, don't waste your money Not a shotgun mic at all, picks up everything in the room! Combined with excessive noise and hiss, the audio is virtually unusable without serious correction. Seriously disappointed with Sennheiser on this one. Promptly returned! Rated 2 out of 5 by Tony from foam falls off easy - no steady light battery indicator I expected better from this brand. I have the MKH 416 and figured this would also be reasonable. The foam falls off easy - no steady light battery indicator. Not impressed.